Susan Midalia's third collection of stunning short stories takes its title from a poem by Sylvia Plath-- a poem, which she stressed at the launch of her book, was not about death, but about childhood, and a joyful sense of enjoyment which we seem to lose or forget as we age. This seems to me an apt metaphor for life, and a moment in time so keenly felt it demands to be captured. In a sense, this is what a short story is, a moment in time or an intense feeling or a fleeting glimpse of a happening. Midalia's characters range in ages and are from various backgrounds. They are female, male, gay, straight, happy, sad, confident, confused, heartbroken and bereft, and it is the variety of this chorus of voices which makes this collection a joy to read. Combined with the writer's masterful turns of phrase, this collection had me riveted from the very first story. My favourite stories were 'Because', an account of a young girl coming to terms with having a mother who had been absent for most of her life, 'Feet to the Stars', a story of a teacher who finds new meaning in his life when he learns to interact with a suffering student, and 'Self-reflexivity and other stuff', a darkly comic account of a creative writing teacher who constantly edits even her own thought processes. It was incredibly hard to choose just these three, as there were many stories in the collection which spoke to me. In fact, at times it felt like I was in the stories and they were about my life. I could relate to these characters without any effort. Their thoughts were things I might have thought, and their fears were things I had feared. While Vanessa, the teacher in 'Self-reflexivity and other stuff' would cringe to hear me say that stories have messages, it did feel at times like the book was trying to tell me something, and I delighted in attempting to figure out just what. Short stories are a vastly under-appreciated form, and for me they are sometimes the most enjoyable. They don't always provide closure in a traditional sense, but the ability to bear witness to a brief moment in time in the span of your average bus ride is a magical contract between reader and writer. It is like sitting and having coffee with a friend, or remembering a favourite birthday party. The time it takes is far outweighed by the lingering impression. 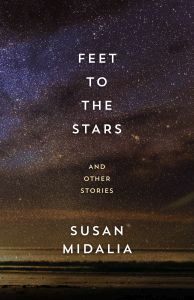 Susan Midalia has proven herself to be a truly gifted writer of short fiction, and I look forward to reading her beautiful stories again and again and again. I gave this collection five stars. Feet to the Stars is available now. Susan Midalia will be the guest of honour at the next Bookcaffe Book Club. Click here for details. Please also check out the events feature on the Australian Bookseller's Association Website to be kept in the loop about bookish events in your neighbourhood.